Skiing injuries are rather common on the slopes and the last thing we want is to be forced to sit out and watch from the sides for the rest of the holiday. A number of our Physiotherapists love to head out to the mountains to ski or snowboard, with some even spending months at a time living in Japan at the Niseko ski resort carrying out physiotherapy and sports massage services. Working within ski resorts, it has been clear that skiing injuries are very common and often can be devastating to a person’s holiday. If you do obtain a skiing injury it is vital you find a professional who can assess and diagnose the problem immediately to ensure you have the correct treatment, as if not managed well initially it can make problems worse. In addition to this flying without having treatment for an injury, especially one that involves swelling, can put you at quite high risk of deep vein thrombosis. If you do need to seek expert advice whilst you are out there then most of the time travel insurance can cover costs of treatment needed, therefore make sure you choose your policy carefully so it can cover the activities you are doing. This usually occurs when the knee is twisted beyond its normal range of motion. Normally you’ll hear or feel a pop in the knee and the joint will then give way, giving sufferers the impression that they have dislocated their knee. In most cases you will have instant throbbing sharp pain and alongside this there will be a significant amount of swelling. When trying to walk on it you will probably find that your knee feels unstable. The MCL, another ligament of the knee is damaged when force is applied to the outside of the knee. They tend to occur when a skier is racing down a mountain and they fall over without changing their body position. It can also be injured when falling over and your knee falls inwards. Often this can occur alongside an ACL injury. You will experience pain on the inside of the joint, followed by swelling and bruising. It will probably be uncomfortable to weight bear on. Shoulder injuries, often dislocations, occur with falls directly onto the shoulder joint, or onto an outstretched hand and the force of the fall is transmitted up the arm to the shoulder. Additionally this type of fall onto an outstretched hand can cause wrist fractures. If dislocated, sufferers will quickly need to have the shoulder replaced back into its joint and then likely kept in a sling for a moderate period of time. From the sheer physicality of skiing/snowboarding, which as well as being on the mountains for long periods of time it also involves lugging your heavy equipment around, people who normally lead quite a sedentary lifestyle can quite often find themselves injuring their back. It may be twisting in an awkward direction or just that one run too many that leads to this, but quite often it leaves people unable to go out on the mountain the next day. “It’s not unusual for most people to pick up skiing injuries here and there, but a lot of the time it comes down to preparation before the holiday. After all skiing is not a cheap activity and you want to make the most out of everyday on the slopes. 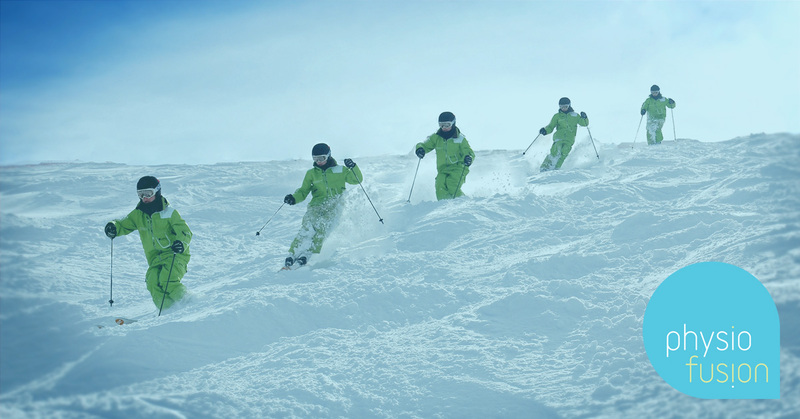 As well as this on average skiing can burn up to 400 calories an hour so it’s not just a walk in the park. Therefore, firstly I would advise trying to start building up the activity that you do and incorporate some strength and conditioning training in order to accommodate an exercise packed holiday. Using myself as an example, before my last season I did barely an strengthening work and I had quite a few niggles here and there which stopped me getting out on the slopes. So this year I’m currently partaking in weekly Pilates classes and I can certainly tell it’s working by the ache I feel afterwards. Secondly, if you do have any pain or injury before you go on your ski holiday then don’t just leave it as your body will try compensate for it on the slopes which can then lead to more serious injuries, like the ones above. So get yourself booked in to see myself or any of our other great physios to help reduce the chances of further injury. As well as this when you are on holiday then just listen to your body, if you feel yourself getting sluggish or tired then it’s time to go home. A slight loss of concentration can be all it takes to make a mistake then causes injury. So whether you feel you have a bodily imbalance that could to lead to a possible skiing injury on the slopes, or you just want some strengthening advice to help you before you go, talk to a physiotherapist. Or alternatively, join on to our physio led Pilates classes. As fun and exciting as the mountains are, there are also many risks and dangers. We want to make sure you head out to the slopes in the best shape possible and return in as equally good shape. If you would like to talk to us regarding a skiing injury you have, or you have a skiing holiday planned and would like some advice, we’d love to hear from you! Send us a message using our FREE online Ask-A-Physio service on our website. Alternatively, you may call us 01282 453 110 to book or arrange any appointments with our Physiotherapists.